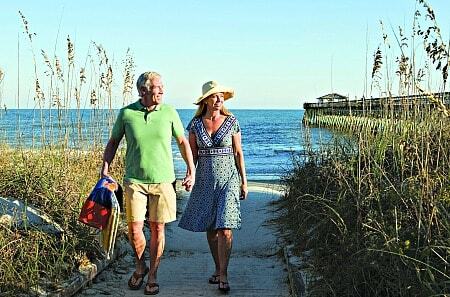 Myrtle Beach is an important retirement destination with many 55+ communities in Myrtle Beach for every price range. The senior population here is increasing. The area has 3 hospitals, a Market Commons (combination of residences and retail), the ocean beaches, shopping, restaurants, abundant entertainment venues and more. In other words, something for everyone. 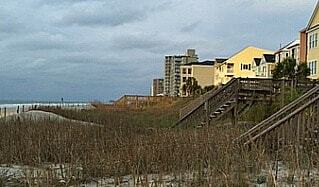 It is also a popular vacation destination along the Grand Strand. 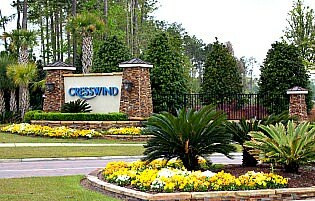 Cresswind Myrtle Beach - A truly inspired lifestyle for active adults in Myrtle Beach by award-winning Kolter Homes. Named one of the "top 50 Best Master-Planned Communities" in the United States by Where to Retire magazine. It ranked as the best active adult community in Myrtle Beach in 2017. Resort-style community with 2- and 3-bedroom detached single homes and 2-car garages starting $300's. Near the airport, only about a mile to The Market Common with shops and restaurants, Myrtle Beach State Park, Grand Strand Regional Hospital and more. Very close to ocean amenities. I would recommend making an appointment before going, if you want time with an agent, as this community is very popular. 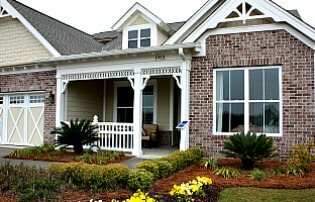 Del Webb at Myrtle Beach - In the master community of Grande Dunes - Medium to large homes with resort amenities including 2 golf courses. This area is out of the congested areas but convenient to all the restaurants, beaches, and activities associated with Myrtle Beach. Beach access. Some plans have private suites for guests (verify). Price starts in $300's. Open daily except holidays. Carillon at Tuscany Carillon at Tuscany - Sold Out - By D R Horton - 55 community of single family homes in master community Tuscany - 3 bedroom medium to large homes start in low $200's. Amenities include Clubhouse, Fitness, Pool, walking trails, fishing lakes and more. 4 different communities here - Carillon is for over 55. 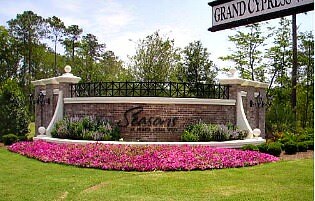 Waters Edge - In North Myrtle Beach by Freedom Homes - Gated over 55 community of single homes starting in mid-$260's. Covenant Towers Covenant Towers - Condominiums near Pine Lake Golf Course on 9 acres. See Independent Living listing below. 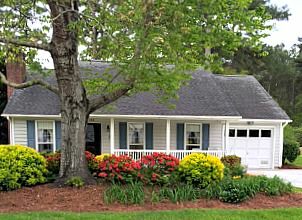 Ocean Pines/Magnolia Grove - By Jensen at Myrtle Beach Garden City Beach - I reviewed this manufactured homes community -- see review for an affordable and very nice community close to the beach and the famous Brook Green Gardens. 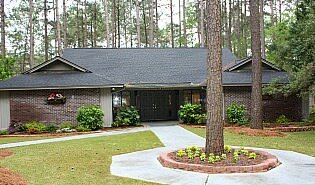 3196 Moonshadow Lane, Garden City Beach near The Grand Strand. There is an office on site but best to call first. 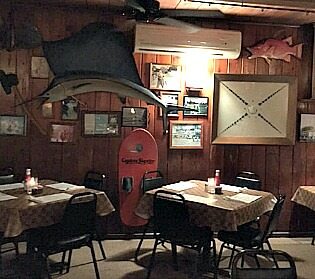 See my on-site review of Ocean Pines here. Belle Mer - Sold Out - Medium to large homes started $260's. Clubhouse, pool, social activities. Low country and craftsman-styled. Bill Clark Homes are not designated as age restricted but may be focused on seniors (verify). 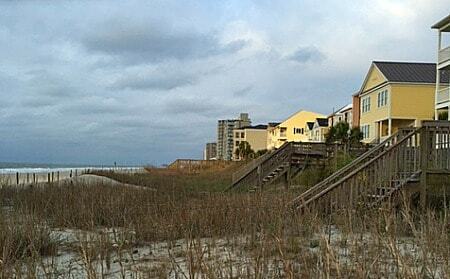 Between Surfside Beach and main Myrtle Beach areas. See local Realtors. 1045 Beaver Run Blvd., Hwy 17 and Coventry Rd. 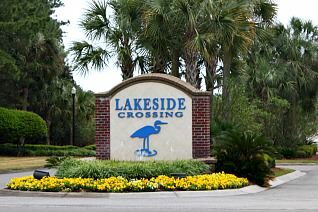 Lakeside Crossing - Conway - Manufactured homes development. This location is further back from the beach between route 501 and 544, but still relatively close. Clubhouse, spa, social amenities, recreation and on-site social director. Priced from $100's for home only (verify). 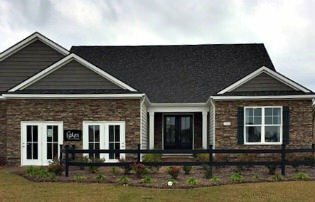 The Lakes at Myrtle Beach SOLD Sold Out - DR Horton - 3 and 4-bedroom single homes were from low $200's. Check back with the builder for any community expansions. Myrtle Trace 518 homes - DR Horton - resales - 15 lakes - 2 and 3-bedroom single homes - Phase 1 began 1980 and last phase was in 2005. Charming neighborhood with serene ambience. Low homeowners. Clubhouse, pool and more. There is a hospital and outlet shops in Conway. See local Realtors. 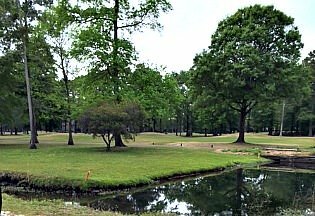 Reflections - Over 55 gated community in Conway of single homes by Freedom Homes - Medium to spacious homes start in upper $100's. Amenities include clubhouse, pool and park area. Woodlake Village Woodlake Village - Murrells Inlet 13 miles south of Myrtle Beach on the Coast. 450 homes - resale. Indian Wells golf course adjacent. Resort amenities. Low homeowners fee. Start $100's. See local Realtors. "Seafood Capital of the World." 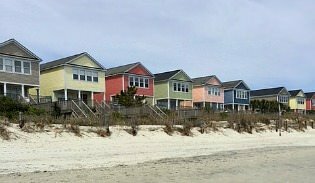 Bill Clark Homes does not classify their communities as age-restricted but, depending on the community, the majority of residents at their Myrtle Beach area communities are over 55 (please verify with the community.) See their website for all Bill Clark Homes. Pheasant Run at Collins Creek - Between Murrell's Inlet and Surfside Beach off Rte 707 at Pheasant Run Dr. - By Bill Clark Homes. 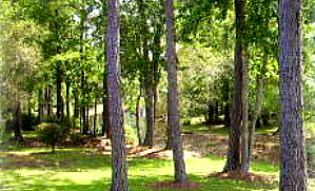 79 spacious homes on wooded and lake view lots - start in $240's. Surfside Beach Club - Sold out - Large homes in gated community started $300's. 6 miles to International Airport - l.7 miles to beach. Off Highway 17 Bypass. See local Realtors for resales. Myrtle Beach: The Lakes of Myrtle Beach, 240 Wateree River Rd. Myrtle Beach: Cresswind at Myrtle Beach, Farrow Parkway and Cresswind Blvd. 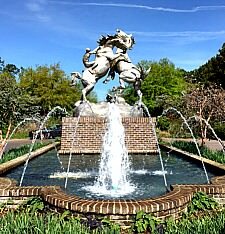 Myrtle Beach: Carillon at Tuscany at 4073 Belle Terre Blvd. 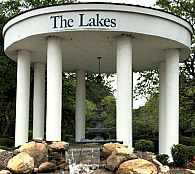 Conway: Myrtle Trace at 101 Myrtle Trace Dr.
Covenant Towers - Covenant Towers - There is a skilled nursing facility located on the campus - Adjacent to Pine Lakes County Club - Choose your apartment size from studios to 2 bedrooms with dens with balcony. Brightwater - This is a continuum of care community for independent, assisted living, memory care and more. Some may prefer this style of community. For independent living, there are cottage homes starting in the high $200's. There are also villa homes starting in the mid-$100's. Occupancy fee. 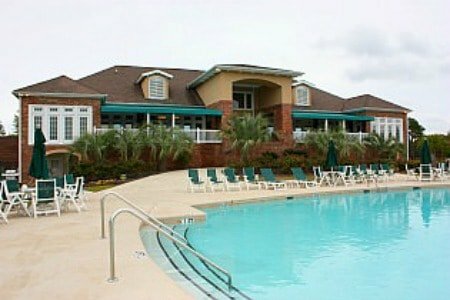 Call for details 843-353-6440 - 101 Brightwater Dr.
Myrtle Beach started out as a small beach town some 50 years ago but it is very obviously now a large resort area, and still growing, with housing for seniors in every price range. Driving down highway 40 I saw one billboard after another advertising retirement communities at Myrtle Beach and new homes. Everywhere in South Carolina are the tall dark-needled pines. They have always been there and probably always will be. Also sprinkled among them are the palms which give a nice tropical feeling. The sand at the beach is very soft and powdery and creamy white. I was surprised to find the water warm as a bath this June day. There was no chill upon going in. The sun gave off intense warmth and the morning walk along the beach was extremely energizing. I also found roadside farm stands loaded with sweet and fresh local produce like peaches, cantaloupe, golden squash, tomatoes, sweet potatoes, and local honey. Myrtle Beach, also known as the Grand Strand, is divided into 3 parts which are the northern end, the central part and the southern end. North Myrtle Beach is a little more quiet, relatively speaking, the center section has the large million dollar resorts and the southern end generally has some of the nicest residential areas including Murrells Inlet and Surfside Beach. It is a 60-mile stretch filled with shopping, restaurants, golf, hotels and condominiums. The main road that goes along the Strand besides Ocean Blvd. is highway 17. Tip: Be sure to stop at the South Carolina Welcome Center located on highway 95 as you cross the state line from North Carolina. They were very friendly and helpful and gave me good advice on where to stay.